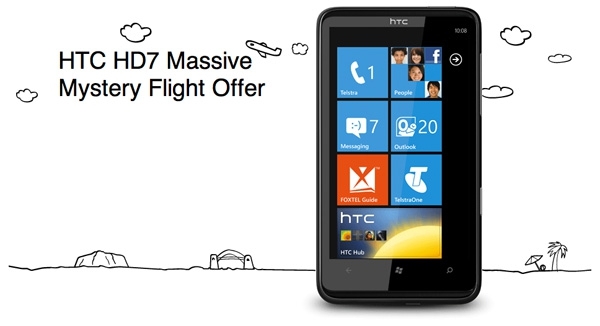 Aussies, if you've been putting off that HTC HD7 purchase, there's no better time to pick one up than now. Why? Because there are freebies to be had. No, we're not talking a mediocre case or headset. Instead, how does a return flight to one of thirty-three destinations in Australia sound? And on top of that, two Xbox 360 games (Halo Reach and Kinect Joy Ride) or 3000 Microsoft Points. Just make that purchase before the end of May and redeem those offers before early June and they're yours. We're not sure what's induced this huge act of generosity from the folks at Microsoft Australia, but whatever the cause, we give it nothing but two thumbs-up. I've travelled extensively in Oz and there are some nice places on that list! Just remember, they're heading into Winter down under, so some of the beach destinations will not be at their best. Not the best time for seeing the Penguins at Phillip Island either, but the Outback would be a lot more tolerable though, and the wineries will be taking in their stock! Now if they only upped the ante to the HD7 S I'd be on that plane faster than a Dingo with a baby in its mouth! $768 AUD outright. There are plenty of contract options available as well. It's also worth noting that this is the 16 GB, 850/2100 MHz model. I think most of Asia is getting 16GB internal memory. Given Australia's high electronics pricing, that doesn't seem too shabby. Electronics have become a lot more affordable here, thanks to the strong AUD. The price I quoted earlier was direct from Telstra. It's available for a lot less (as low as $424) from other online retailers in Australia.